Chenango Canal Association. is conveniently located in Bouckville, NY in Central New York State, right on Route 20, very near the geographic center of New York State. The Canal Museum Cottage is located at the corner of Canal Road and Route 20. Map to the Museum Bouckville is about 40 miles East of Syracuse, 25 miles South of Utica, 90 miles West of Albany and 75 miles North of Binghamton. 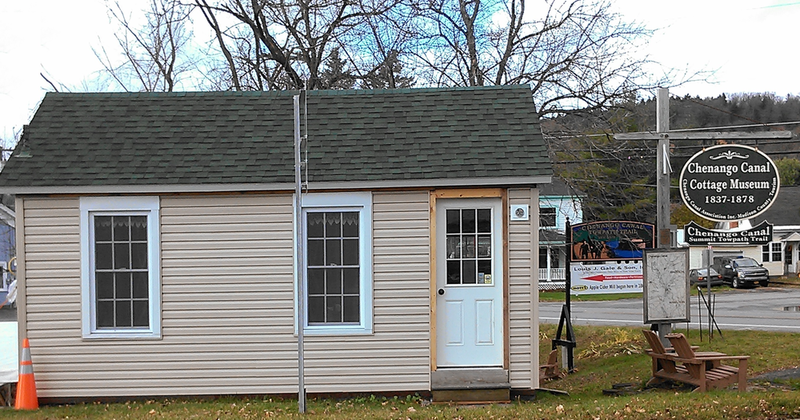 Street address: 3472 Canal Rd, Bouckville, NY 13310. We have a handicap accessible fishing deck overlooking the canal and miles of towpath trail. You can park at the museum or pick up the trail at other locations. The site is open from dawn to dusk. Our new sign was dedicated at Route 20 and Canal Road on November 21, 2009. Funds for the sign were donated by Cadbury-Schwepps, the owner of the Motts brand. The neighboring Bouckville mill was the original location of the Motts apple cider mill. It is the oldest continuously operating feed mill in New York state. The Towpath Trail in Bouckville leads two miles North from the museum to the Oriskany Creek where an aqueduct once crossed the creek. 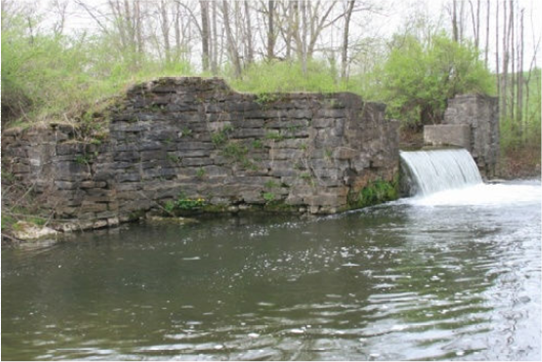 The hand cut stone abutments are still there in excellent condition and water from the canal spills into the creek heading north to the Erie Canal. Photo Room for 2-3 cars at the creek. Walking 6.5 miles south from the Canal Museum leads to the Village of Hamilton. OR, park at the trailhead on Montgomery Street in Hamilton (opposite the Sunoco station) and start the trail here. The trail leads north past the Hamilton Airport and Woodman’s Pond all the way to Bouckville at the museum.